MANA response to comments above regarding higher rates of death? As a physician who attends low risk births in hospitals and a supporter of the midwifery model of care, I find this study valuable and intriguing. Others have commented above on the higher rate of fetal/infant death in the low risk home birthers in this study compared to low risk birth in hospital births. Could MANA make a respond to either of these comments addressing the compared risks? Certainly for me- as we are considering where to birth this next child, death is my greater treat and concern- having seen how healthy low risk births can change rapidly without predictive factors in my hospital practice. Thank you for your work and research. Undoubtedly birthing in hospitals needs to continue to improve to accommodate patients expectations, rights, and health care preferences. Your work contributes to this improvement. Dr. Combs, thank you for your comment. As mentioned above, the outcomes from the Cheyney et al study are not able to be compared to U.S. hospital rates, because the hospital data is not fully reported. The CDC reports neonatal deaths, which are quite comparable to the neonatal rates reported in the Cheyney et al study, but the CDC does not report intrapartum death rates for hospitals. Some have made the convenient assumption that no babies ever die during labor in any hospital setting, but there is no data whatsoever to support that assertion. We look forward to a time when hospital data is transparent in this regard, and we applaud the work of The Joint Commission in their efforts to make this happen. But at this time, it is not possible to assemble a similar low-risk cohort from national vital statistics data for general comparison purposes. Although I am not an OB, I have been caring for people's health for 30 years. Your study reports 1.30/1000 intrapartum deaths. If James Sasek's report of 0.38/1000 intrapartum deaths in low risk hospital births is correct, that is a huge difference, and for me, a deal breaker. I would also say that your reporting of home birth "without an increase in adverse outcomes for mothers and babies", is then unsubstantiated. 0.38/1000 vs 1.3 deaths/1000 may seem trivial, unless that 0.92/1000 is your baby. James Sasek's report of 0.38/1000 comes from "Dr. Amy's" misleading analysis. She squeezed out an early neonatal death rate of 0.38 from the CDC Wonder database and compared it to MANA's intrapartum plus early plus late neonatal death rate. It's these sort of antics that make it really confusing for families to know what to believe. And given the latest press release from Grunebaum and Chervenak about a presentation they're making at a conference - not about an actual study that had been peer reviewed or published, mind you, but a conference presentation - conveniently timed to coincide with MANA's research... well, it's starting to be really obvious that there's more to this debate than providing clear information for mothers and families to make good decisions for themselves. Shameful. I apologize for not citing my osurce. It is via Dr. Amy at SkeptialOB and the data is from the CDC Wonder Database of hospital low risk births for the same time period. The published study here compares data with out dated studies and data sets from other countries with different regulatory environments for homebirths. They authors do not even mention why it doesn't consider the CDC data from the same time period to be comparable though it's publicly available and current. I think that's a huge miss. Thanks for taking the time to review this comment. I'm grateful the MANA data has been published. Please see our response to your similar question above regarding why it is not possible to make full comparisons with hospital data. The Cheyney et al study does not compare to “out dated studies” - all of the other well-designed studies mentioned in the comparisons were published between 2009 and 2013, with the exception of the one prior study on CPM-attended home births in North America which was published in 2005. Several of the comparison studies were indeed conducted in other countries, and it is well-acknowledged that they have varying health care systems and integration of midwives within them. For the most part, those maternity care systems would probably measure up better than the U.S., and it is reassuring that the Cheyney et al outcomes with regard to intrapartum and/or neonatal death were similar, despite the lack of integration of midwives into the U.S. system. Hospital intrapartum mortality rate is .1 - .3/1000? I read that Judith Rooks stated the intrapartum mortality rate for hospitals is 0.1-0.3/1000 for low and high risk. Is that true? She is a CNM. It's true that she said it, I saw her show up on another blog and say it, but apparently it's under dispute. Her numbers seem to be pulled from a bunch of other countries (Wales, Scotland, Canada) and one US state (Missouri). This seems to lend credence to the idea that national numbers are not available in the US or she wouldn't have had to stretch so far to dig something up. At least Judith Rooks is not saying that it's zero anymore, it's too bad that Dr. Amy held her up to be such a hero for that and then she changed her story. Awkward! But as far as I can tell, we still don't know what the intrapartum mortality rate is for US hospitals. That's crazy. Why don't we have this information? I see. This is all very confusing. What about neonatal mortality rates for US hospitals? Are they accurate through the wonder data base? This agrees with all of the studies perfomred in the UK and subsequent good outcomes for low risk pregnancies/births. In fact in my 2 birth centres one co-located and one freestanding I have just published our 3 year data analysis. IN over 4050 births all low risk our caesarean section rate is less than 3.5% with less than 1% of babies admitted to the NICU department for treatment. No fatalities of either mothers or babies and breastfeeding rates of over 98%. THe majority of births are either laboured in water or have all 3 stages of labour in water meaning that actual births in water is near 75% again with no contamination or readmissions for babies or mothers. I am no statistician but I am confident in midiwfery led care and I would say that as our model is being replicated in more than 10 oethr units throughout England we have a good safety and outcome record. Why aren't you addressing the concerns? There are several comments here that concern me. I keep checking back to see if anyone from MANA has responded. But no one has. Instead the comments have just been rearranged so that the comments giving praise are now at the top and the newer comments addressing concerns are now at the bottom. MANA, please address these questions. I need answers. All comments have been responded to; please let us know if there are still specific questions that you feel have not been adequately addressed. Brooke Orosz, PhD, a professor of statistics, has offered an unbiased analysis of the MANA study. MANA, what is your response? "In other words, the expected number of deaths from causes other than congenital anomalies was at most 12, and the actual number of deaths was 35 (44 with anomalies included). It is clear that home birth substantially increases the risk of neonatal death and of intrapartum death." "15.5% of the mothers in the MANA STATS group experienced a postpartum hemorrhage over 500ml, with 4.8% losing over 1000mL. Nationally, only 3.3% of vaginal births resulted in a postpartum hemorrhage exceeding 500 ml, with few exceeding 1000ml, and only 2% of cesarian births involved a PPH exceeding 1000 ml. (3) These nationwide numbers do NOT control for preexisting maternal risk factors, which are more prevalent in the hospital group as previously noted. Clearly, home birth substantially increases the risk of PPH." "The mothers in the MANA STATS cohort experienced fewer childbirth interventions than comparable-risk women giving birth in the hospital. However, the rate of intrapartum stillbirth or neonatal death was considerably higher, and the difference was particularly alarming among high-risk subgroups such as breech and VBAC. The incidence of low APGAR was significantly higher and may have been much higher. The risk of postpartum hemorrhage was substantially higher. Women considering home birth should be aware of these risks. Furthermore, the risk of death is increased for babies in breech presentations, and infants born to first-time mothers or mothers with a prior history of cesarian birth." Yes I can, yes I can, yes I can!" believe them. It really is too easy to tweak stats for them to have any meaning. People will believe whichever stats backs their own beliefs. MANA, thank you for the work that you do. I just read through the comments and want to make a point about these DIY hospital control groups that bloggers are piecing together from the linked public access data. It's misleading and really meaningless to report rates without confidence intervals or significance testing of any sort. As you know, rates based on small numbers of events can fluctuate widely from year to year and place to place for reasons other than a true change in the underlying frequency of occurrence of the event. You simply cannot say "2 events per 1000 is twice as many as 1 event per 1000 and over time that leads to X excess events" without any hint at naturally occurring variability. No, no, no. That would be masquerading a false accuracy. To put it another way, if the infant mortality rate in my state jumped from 3 per 1000 to 6 per 1000 over a few years, should we worry? Or if it fell from 6 per 1000 to 3 per 1000, should we celebrate? I wouldn't know without an estimate of sampling error. That is just one of my issues with these pseudo control groups. 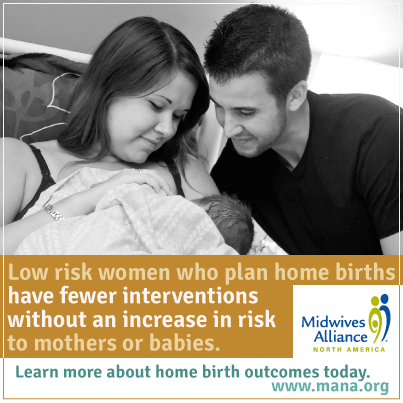 Important to remember that midwives and birthing centers accept ONLY low-risk pregnancies. So, of course home birth will, like the article says, have fewer: episiotomies, pitocin, epidurals (moms deciding on home labor typically go in to it not wanting an epidural), c-sections. Also, you are not forced to have an epidural at a hospital. Do your research and find an OB and hospital that will let you take charge as the one in labor. Babies have died or had severe brain damage from being born at home and not having fast or good enough access to oxygen. There are midwives out there who are not certified. You need to do your research. At least you know that hospital policy and legality will make sure your doctor has a legit certificate showing their training. I think the best of both worlds is to have a doula and/or midwife working alongside your doctor to deliver a baby where the baby or mother can get immediate access to medical attention if needed. Valuable suggestions - I was fascinated by the specifics - Does someone know if I might get access to a blank NY DTF ST-100 document to work with ?